Here's the latest OSA Copycat email we have discovered. 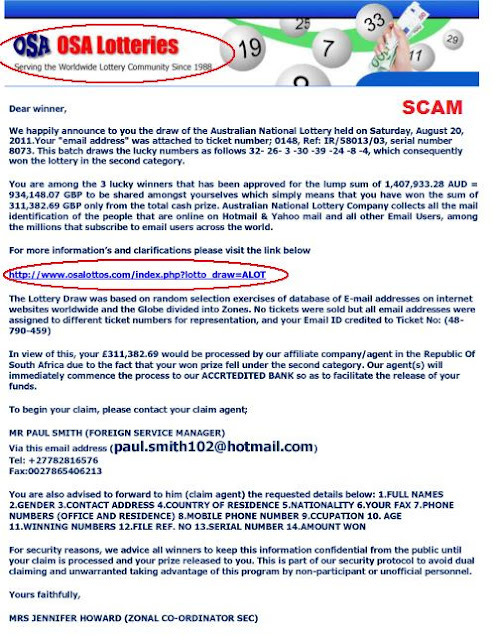 Note that the scammers went as far as copying the letterhead and results URL of Australian Lottery. If you should ever come across this scam, please don't pay attention to it. Remember that to win any lottery game, you must first play. The OSA (Overseas Subscriber Agents) in conjunction with other international government lotto subsidiaries have expressed their diligent worry of the prevalence of lotto related scams that are currently being distributed through email and snail mail all over the globe. This attempt at cheating people off their hard earned money by luring them with quick rich lotto scams are beginning to dampen the reputation and reliability of the international lotto community. The following steps will help you identify Lotto Scams. Go through the lotto offer with due diligence and a keen eye for detail. Most Lotto themed scams will say the same thing, a suspicious message congratulating you for winnings but will come with a catch: to claim your prize you must send them a fee. The typical modus for these Lotto Scams will tell you that you have been selected through a computerized ballot and will mention trigger words such as “claim agent”, “Processing fee”, “bank fee” or “insurance”. The Lottery email or mail will encourage you to exercise confidentiality until your winnings have been successfully “processed” and the money has been deposited to your bank account. They will them proceed to warn you that any breach in the confidentiality clause will automatically disqualify you from receiving your earnings altogether. The Lottery advisory will then provide you instructions about claiming your prize, that will be delivered via a courier service or a secure payment system of which you will have to pay for delivery and storage charges. Another easy tell that the lottery advisory is a scam is through the use of common sense: There is no way that you could have won a cash prize if you did not enter the specific lottery to begin with. Always keep in mind that you shouldn’t send any kind of payment for a Lottery that you didn’t join. If in fact you did win a huge sum in a lottery that you joined via OSA, you will receive a phone call that details the exact amount of your winnings and ask you for a bank where you would prefer to claim it. All prize remittance are totally free of charge as part of your offer from OSA. There is no charge of any kind, OSA will never ask you for “taxes” or “fees” in order to receive your winnings. You can also verify your winning prize by contacting the helpdesk which is available 24 hours a day or through the online portal at http://osalotteries.com/helpdesk. There is also the option to send a fax about your inquiry, giving us a copy of your “winning notice” by sending it to (+3120) 638 3429. 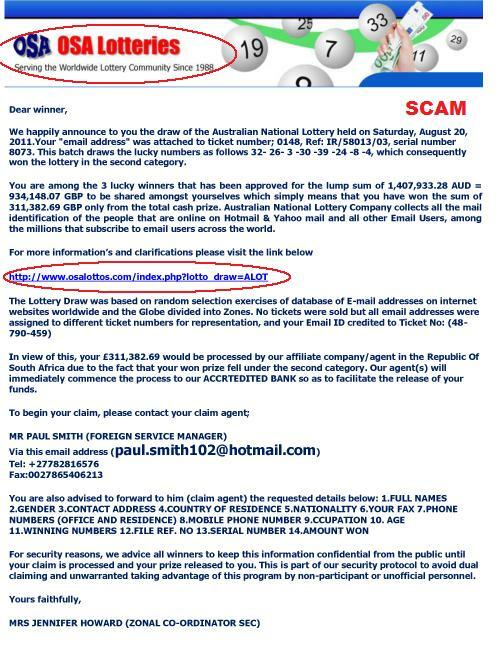 Your vigilance is important to bring down these Lotto Scammers and so that you can avoid being victimized, as these emails and letters can easily deceive. Thousands have already paid the price and have lost a lot of money by paying these “taxes” and “fees” in order to claim the lotto winnings they have been promised. To date, a huge amount has already been associated with this type of scam and continues to plague earnest Lotto marketers and Government Lottery systems. OSA has been a remarkable system that has more than 155,000 players taking advantage of overseas Government Lotteries and Draws since 1988. Avoid lotto scams by sticking with genuine lottery companies like OSA and get a real chance to win in the Government and state lottos from all over the world.